There have been times when I have felt a connection. There have been times when I have known things that I really had no way to know. There have been times when I saw that another person felt uncannily understood, and I felt embarrassed by the intensity of the connection. There have been times when I dreamed a dream that filled me with the most profound pain or shame. I have watched as these dreams came to pass outside of my mind, only for someone else rather than for me. There have been times when I have felt so much for others that I was overwhelmed and almost unable to carry on. And there have been things that I have never fully felt for myself. Sometimes I remember. Perhaps it is more true to say that always I remember. Sometimes though, I see. I see the grief unobserved, unheld, unmarked, unmarred by my meager methods of processing such things. I know, with the same knowledge that I have others’ lives, that this is something which must be felt. And it is. Yet it is not. I feel, but I feel with a peculiar understanding of another’s pain. I do not know why it is not my own pain. I do not know why it does not overwhelm. I do not know why it exists with such strength, but somehow fails to demand its proper due. Perhaps there are some things that must simply be lived out. Is it possible that there is some pain too profound to ever fully feel? I do not know. There are some things which I do not wish to make myself feel, because I do not wish to sully them with the melodrama of self-indulgent grief. Besides, what am I supposed to do? Sit down and order myself to grieve properly? Some things must happen in their own way. I accept all of this. Yet sometimes I see it there–like a ghost seen out of the corner of one’s eye, which can be ignored only for so long–and I wonder whether there is not something very precarious about a grief unobserved. I think this might be my favorite post you’ve ever written. I’ve read it at least 10 times since you first published it and each time I love it more. 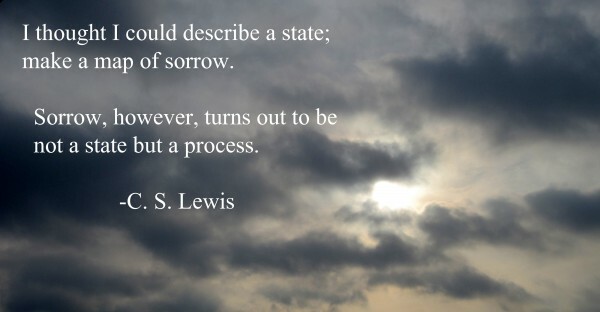 Yes, there is something precarious about grief unobserved.